This is the second book in All Souls Trilogy, I previously reviewed the first book, A Discovery of Witches. This review may contain spoilers for previous books in the trilogy. The present has become far too dangerous for Diana and Matthew. A vampire and a witch are not supposed to be in relationship with one another, and Diana and Matthew’s marriage puts their very lives at risk. With others out looking for them, it would be impossible to find a witch who can help Diana master her long-dormant powers, and her powers must be mastered if the couple and their friends and family are to be safe, and if they are to ever find Ashmole 732. With so much at stake, staying in the present is not an option. Instead, Diana and Matthew timewalk about to Elizabethan England, stepping into the life that Matthew once lived. For a historian, this seems to be the opportunity of a lifetime – particularly once Diana discovers that Matthew’s circle of friends at the time included the infamous School of Night – but fitting in in the past is more difficult than Diana would have ever thought. Still, being able to see some of the people and events that shaped the Matthew she knows in the present, as well as the possibility of finding Ashmole 732 while still intact and that of learning more about her own abilities, is too great an opportunity for Diana to pass up. It is no secret that I adored Deborah Harkness’s debut novel, A Discovery of Witches. 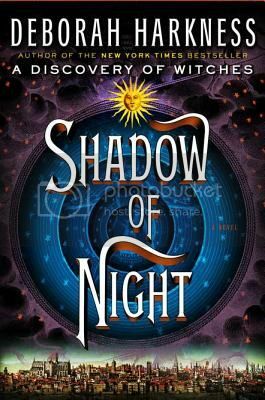 Shadow of Night picks up exactly where A Discovery of Witches left off and, is perhaps even the better book. Many times, the second book in a series serves more as a connector between the first book and the second than a story worth telling in and of itself. Shadow of Night, however, is a strong story on its own, and does not require the extensive character and world building that A Discovery of Witches had, thus allowing Harkness to jump straight into the story – after all, we were left with a bit of a cliffhanger at the end of A Discovery of Witches. There is a bit less of her vampire/daemon/witch mythology here than there was in the first book, which is mildly disappointing, but only in retrospect. While reading, there is no time to wish for anything more, what with the witch hunts lurking ever present in the background, and meeting Matthew’s father. The one problem with Shadow of Night? I don’t even know how long I’m going to have to wait for the end of the trilogy. Diana Bishop comes from a family of witches with illustrious lineages, but there are few things she detests more than using magic. Sure, when the washer is threatening to flood the house she might make an exception, but in general she wants to get by in the world on her own merits, not by magic. She is forced to change her attitude, though, when in the course of her research, she accidentally discovers an enchanted and long-lost alchemical manuscript that many in the magical world would kill for. Suddenly, Diana finds herself caught between the witches, daemons, and a handsome vampire named Matthew Clairmont. Now Diana must decide who she can trust and find out if she can control her power, before she is destroyed by forces she does not understand. Deborah Harkness is a fabulous creator of worlds. Her witch/vampire/daemon mythology is almost instantly engaging, and is spread out enough throughout A Discovery of Witches to keep readers (or me, at least) anxiously reading to figure out the next piece of the puzzle. There is some serious initial shadiness in Diana and Matthew’s relationship that feels a bit Twilightish, but eventually they grow into a greater parity – although there is still some problematic hiding of facts on Matthew’s part that I hope will become less of an issue as the trilogy progresses. I must admit, though, that it adds to the dramatic flair of Harkness’s story to have these things revealed slowly, as Matthew is essentially forced into them. 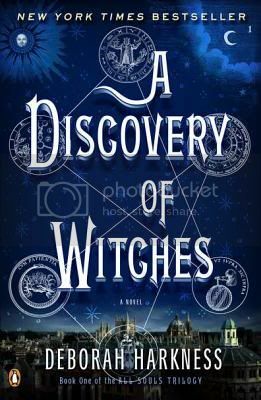 A Discovery of Witches is an incredibly addictive novel in the vein of The Historian, but with a somewhat faster moving plot, there is even a similar theme of scholarship. I can’t wait for the next book in the series, Shadow of Night. Highly recommended. *These links are all affiliate links. If you buy your book here I’ll make a very small amount of money that goes towards hosting, giveaways, etc. In this sequel to “The Strain,” New York – and much of the rest of the world – has fallen to the vampires, although many people are still denying exactly what is happening. Vasilly, Eph, Nora, and Abraham Setrakian are still working together to fight this viral vampiric scourge, but their actions are becoming increasingly independent, this Nora trying to remove her mother and Eph’s son from the city, Setrakian working with a gang – literally – of vampire hunters, and Eph bent on his own act of vengeance. The more I listened to the “The Fall,” the more I realized I wasn’t really buying the idea, so central to this series, that this form of vampirism is a virus. As with traditional vampires, victims are infected when struck about the neck – although these vampires do not strike in the same way traditional vampires do. While the vampires feed, their blood worms make their way into the body of the victim, which is what then creates a new vampire. I believe at one point it was explained that the real cause of the vampirism was a parasite carried by the blood worm. So if it is a parasite, it clearly is NOT a virus, and you would really think that Eph and Nora, both formerly of the CDC, would get that. I suppose it really isn’t a major issue, but it was starting to really bother me. Besides that realization, there was a bit of middle-of-the-series-slump about “The Fall.” I really appreciated that del Toro and Hogan advanced the storyline and took things in a new direction instead of just making this a second book of fighting against the vampires for New York City, but it took me well over half of the book before I got into the story. There was not quite as much action in the first half of the book, which made it a bit slow, compared to “The Strain.” Still, the storyline itself was strong and interesting, and I appreciated more of a look at the mythology of this vampire, as well as Setrakian’s earlier vampire hunting days. Oreskes did a good job with the narration, I may have even liked him better than the man who narrated the first book (yes, there was a narrator change between books one and two in this series). I did have one problem with the audio production, though, and that is the way that the book switched between different characters’ stories. Most chapters include multiple points of view of different characters, but the editing of the finished product did not contain enough of a pause or any other indication that the setting was changing, occasionally confusing me as it seemed that we were going from Vasilly to Nora almost in the same breath when they were in very different situations. Although perhaps not quite as captivating as “The Strain,” still an integral part of the series. It would probably work pretty well either in audio or print. I’m looking forward to the last book in the trilogy next year. Around the year 2015 or 2020, the United States government begins a new experiment, one aimed to ensure the pax Americana for many years to come. Instead of going through the expense and time of training soldiers just to have them die or be injured in the field, the military was hoping to find a way to modify soldiers to give them incredibly long lives and make them incredibly difficult to kill and injure. The secret seems to be in a virus discovered in the jungles of Bolivia. Of course, soldiers can’t just be injected with an unknown vaccine, so an arrangement is made to allow 12 Death Row inmates to keep their lives if they agree to be part of Project NOAH. Evidently nobody realized that a virus that causes immortality + convicted murderers = not good. This background, along with the introduction of Amy and the first few years after BAD THINGS HAPPEN, comprise about the first 200 pages of the book. The next 560 pages take place about 100 years after the initial BAD THINGS, and are centered on a small enclave of survivors in what used to be California. I think this fact, that it takes 200 pages to get to the majority of the main characters, is a large part of the reason that “The Passage” lacked the necessary immediacy to be a great apocalyptic thriller. That’s right, I said it was lacking and, therefore, not great. Minority opinion alert! I know everyone loved this, but I just didn’t. I liked it, don’t get me wrong. The prose was competent at the worst and really quite lovely in some places. The idea of the story that Cronin created was also quite interesting. Mostly, the book was just way. too. long. Nearly 800 pages for the first book in a trilogy, I think it should have been 200-300 pages shorter. There were 450 pages in the middle during which nothing really grabbed me, and that’s not good. The excessive time it took me to be introduced to the main characters and the fairly uninteresting nature of the early part of their story kept me from really ever caring about them and, thus, detracted from the immediacy and fear that a book like this needs. I might have been a little more tolerant of the book had a throwaway line early in the book about Jenna Bush being the governor of Texas been excluded. That sort of thing really annoys me, it is just trying much too hard to be clever and it seems very unsophisticated storytelling to me. Overall a very interesting concept, but the execution left something to be desired – namely a strong editor. I will likely read the next two books in the series, but there’s no way I will be buying them in hardcover – I’ll wait for paperback or a copy from the library – and, honestly , I don’t think that you need to buy this one in hardcover either. If you don’t want to be left out of the discussion about it this summer, get on the library waitlist now. This review was done with a book received from a friend.